Our mission is to provide orphans and widows the spiritual, physical, emotional and educational support they need to become solid citizens in the Kingdom of God, ultimately for the glory of God and the advancement of the Kingdom. Our vision is to build a sustainable organization capable of meeting the needs of the precious women and children of Guatemala. Expanding of Children’s Homes to ultimately serve 150 girls and 100 boys in Monjas, Guatemala. Launching 1,000 women into independence and stability. Enhancing our sustainability program so that we are producing the majority of our own food and energy on the property. Opening a pregnant teen’s home where we can serve these precious children and the babies they bring into this world. Implement programs that will help the hardest to reach children stabilize and heal in a safe environment while learning about the love of Jesus. Replicating our programs and services into other geographical areas. Our kids come from a variety of background, including physical and sexual abuse, abandonment, neglect, humans trafficking, and/or the loss of one or both parents. Our goal is to raise these children in a way that they can find peace and experience the healing love of Jesus Christ. Education is a critical part of breaking the cycle of poverty and hopelessness for our children. Our award-winning school provides our kids and education from preschool through high school. Through our women’s program, we are helping widows, single mothers, and our older children receive an education and job training so that they can reach their full potential and care for themselves and their children. HUMILITY: We follow the example of Christ and serve one another with humility. WORK ETHIC: We are hard workers and do all things with excellence. SACRIFICE: We sacrifice personally (time, talent, and treasure) to help each other and those we serve. SERVICE: We live lives of service, modeling this for those within and outside of the organization. INTEGRITY: We do what is correct and honorable, no matter the personal cost. COMMUNITY: We are created for relationship Therefore, we always do all we can to resolve conflicts and live in pace and relationship with others. INITIATIVE: We always look for ways to help. COMMUNICATION: We communicate openly, honestly, and respectfully at all times. HONOR: We honor each other with the respect that is due one another. We honor those with authority over us, those with wisdom, and those we serve. HONESTY: We speak truth in all situations and will be honest in all we do. We will not hide things in the dark but will bring everything to the light. In 1999, a donor from the States began looking for someone within Guatemala that would manage the distribution of food, clothing and other items to widows and orphans in Guatemala. The original donor had been moved in his heart by the verse in the Bible found in James 1:27, which teaches us that to take care of widows and orphans is to do the will of God. This new ministry became known as the James Project of Latin America. The ministry began small – taking boxes of food, firewood, shoes, sweaters, and other items to different parts of Guatemala as the need was made known to missionaries Gilbert and Joanne Simpson. The Simpsons also managed educational sponsorships for orphans who desired to attend a Christian school. It wasn’t long before what began a trickle of dollars into Guatemala increased to a few thousand, as the Lord began to affirm His calling by way of supplying the needed finances. The leadership, desiring to be the best stewards possible, formed an advisory board and began to pray and seek counsel. 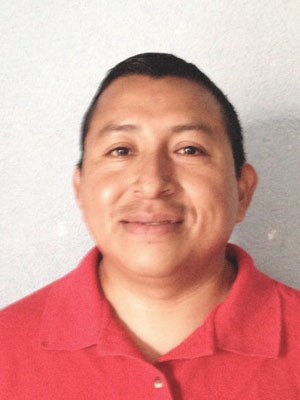 In October of 2001, they formed an official board of directors made up of five Guatemalans and five North Americans. 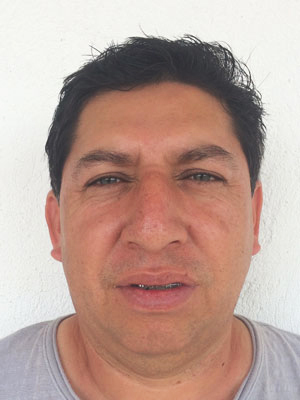 They retained a lawyer, found a site for the home for the children (at that time in Guatemala City), purchased household appliances and furniture, completed the necessary paperwork for the Guatemalan government, opened a bank account, hired the necessary personnel and Shadow of His Wings became a reality. The Guatemalan government gave them official approval to receive children through the national court system in May of 2002.
matter their age. This was just another blow to their already damaged self-esteems. Another big problem was the number of homework projects that are a routine part of Guatemalan education. It was terribly difficult for a couple of house parents to keep up with and buy materials for and help with all of the projects that were continually coming home with the girls. For those reasons, the second ministry that was launched as part of the James Project was Evangelical Freedom School (originally James Christian School when in Guatemala City). The school started with the elementary grades in January of 2003 and has now been approved to give classes through the end of high school (the study for a career here in Guatemala). At present, we have opened up Evangelical Christian School to the families of our small town of Monjas and there is quite a waiting list. This is because of the excellent administration, talented and dedicated staff, and glowing reputation they have earned in the community, as well as in the country as a whole, because of the excellence in education and many other accomplishments. The site they had in Guatemala City housed 24 children and was full nearly all of the time. With Guatemala City being an increasingly dangerous place, the directors began to look for property in more tranquil areas of Guatemala to get the girls a bit more space and enable them to run around and play and stretch their legs a bit. The City was also potentially dangerous with many of the very people that had harmed the girls knowing exactly where they were and being able to show up looking for them. Thus began the search for the perfect piece of property for James Project of Latin America. In October of 2004, the directors finalized the purchase of 10 acres of cleared land in Monjas, Jalapa, a small cowboy town about 3 hours outside of Guatemala City. This beautiful piece of property includes a HUGE ceiba tree, which is the national tree of Guatemala. This tree is well known in the community and is a meaningful symbol for the James Project. Construction of a wall to surround the property began right away, then an entryway, then the first girls’ duplex. The girls moved to Monjas from Guatemala City in December of 2005 to comply with the government mandate that students not change schools in the middle of a school year. 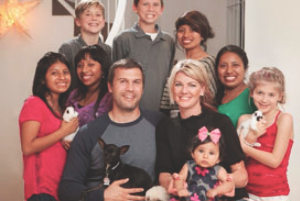 Since their new house on the James Project of Latin America property was not yet ready, they moved into the rented house for visiting teams for a few months until they were able to move into the first duplex in April of 2006. Since that time, JPLA has added 2 more duplexes, an administration building, a multipurpose building, a school, boys’ home, a daycare, a small medical clinic, and a learning center. Through another set of miraculous circumstances, in November 2006 JPLA was able to purchase the piece of property next door to the original site for the boys’ home and the school. 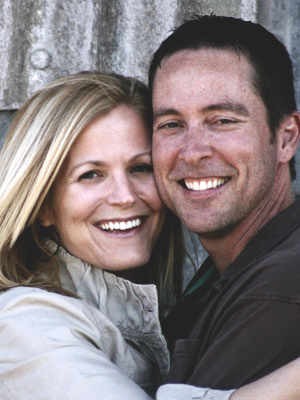 In fall of 2013, Joanne and Carroll stepped down as directors and Bryon and Tiffany Applegate, long-term supporters and friends, moved to Monjas to serve as directors. They have a great love for the kids and the project and have been serving faithfully since that time. 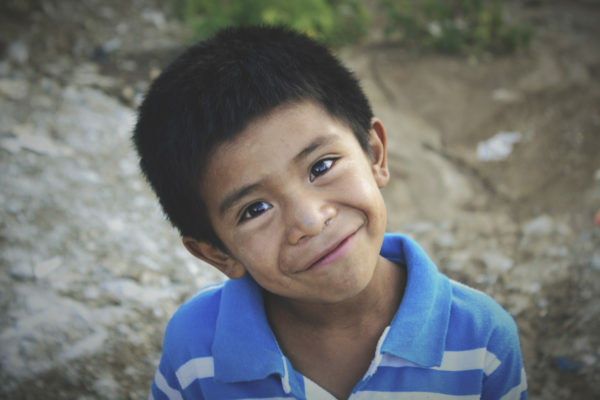 The need for children’s homes in Guatemala is still great despite the ever-growing number of orphanages. There are literally tens of thousands of children in Guatemala who need someone to love them and take care of them. The James Project of Latin America wants to help but we need your help and support to make it happen. Please contact us to see how you can get involved today! 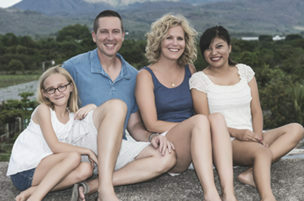 Bryon and Tiffany Applegate and their three daughters (Jaqui, Sierra, Aramie) have been involved with JPLA for years leading trips/teams, volunteering, and providing child sponsorships. 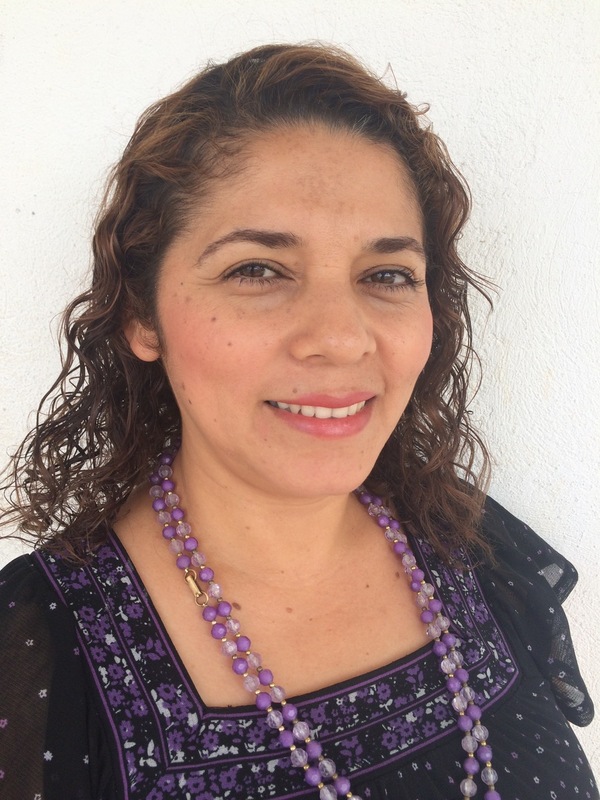 They moved to Guatemala in October 2013, and are now serving full-time as Co-Directors of JPLA. As Directors, they are responsible for all areas of the James Project of Latin America, including Shadow of His Wings Children's Home, Evangelical Freedom School, and the Redeemed Women's Program. Their mission is to provide holistic healing and care to the women and children they serve, and to share the Gospel with everyone they meet. 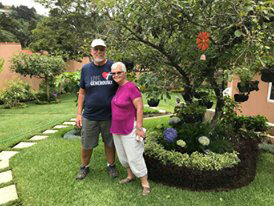 Dave and Sue have been involved in Guatemala for many years. While at a VBS outreach, they came face-to-face with the situation that many of the children in this country face. They knew then that they had to do something more. 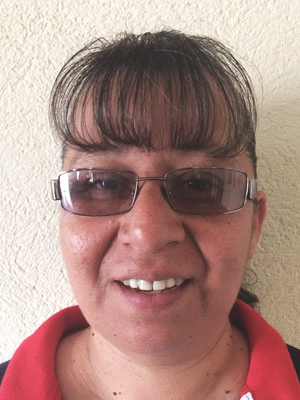 With Dave's background in agriculture and Sue's in administration, they knew they could meet help meet the needs they had seen in Monjas through the ministry of JPLA. They arrived at JPLA as full-time missionaries in June 2018 and have been working to benefit the amazing people of this country ever since.